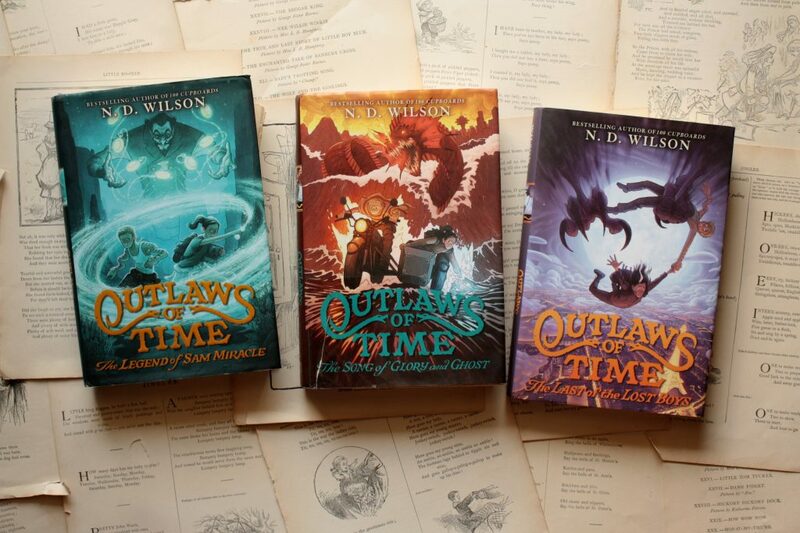 Is there a better moment for a bookworm than the one when a favorite author announces that his newest book will be a reentry into the world of one of his most beloved series? I doubt it. But is there a more depressing moment than the one that comes when a reader realizes, halfway through the new book, that the original series was better without the late entry? No. After a few experiences of that sort, I’ve come to regard announcements like this one with an immediate rush of joy (a return ticket to a beloved world!) followed by apprehension (But what if it’s like Clariel?). 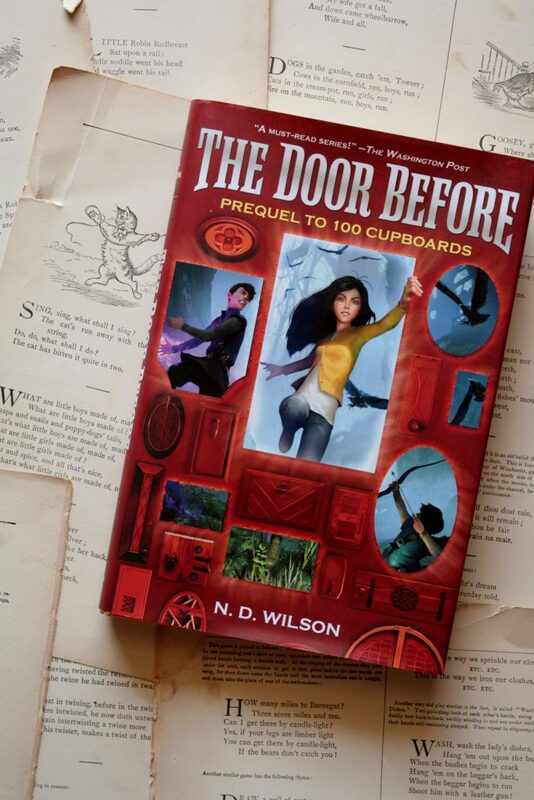 But when ND Wilson announced The Door Before, a prequel to his 100 Cupboards trilogy, the apprehension didn’t flood over me, but only lapped quietly at my toes. If anyone could do it, I thought, ND Wilson could. And he did. He did it right. 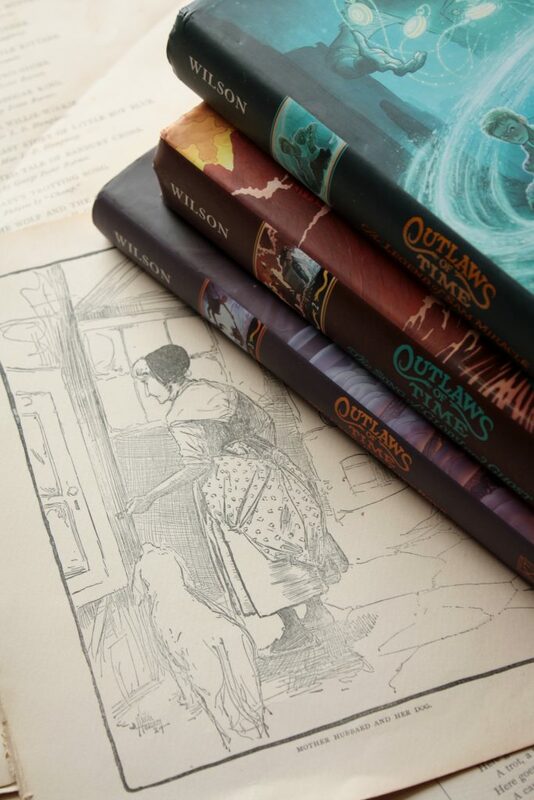 The Door Before introduces us to new aspects of Wilson’s ever-expanding world, and masterfully links (so I hear) this series to his Ashtown Burials series. 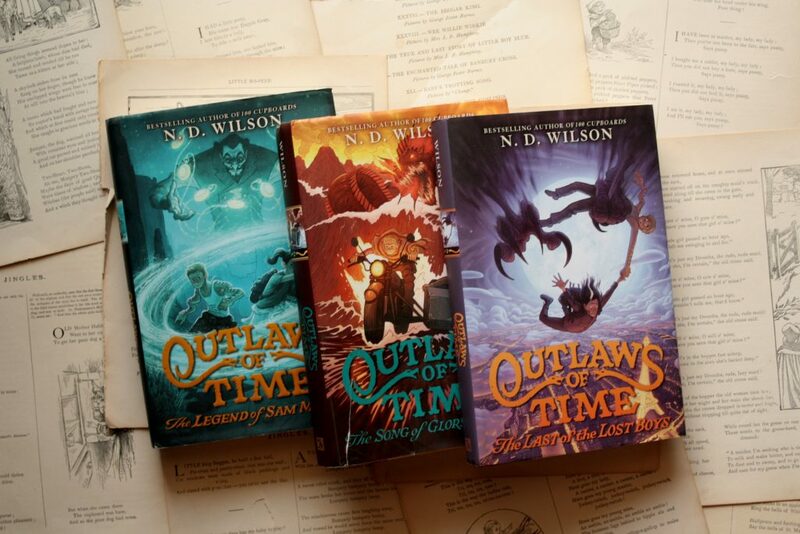 Because I haven’t yet read that other series (I have been saving it, so I’ll never not have an ND Wilson series to look forward to), I can’t comment much on how delightful that is, except in theory. 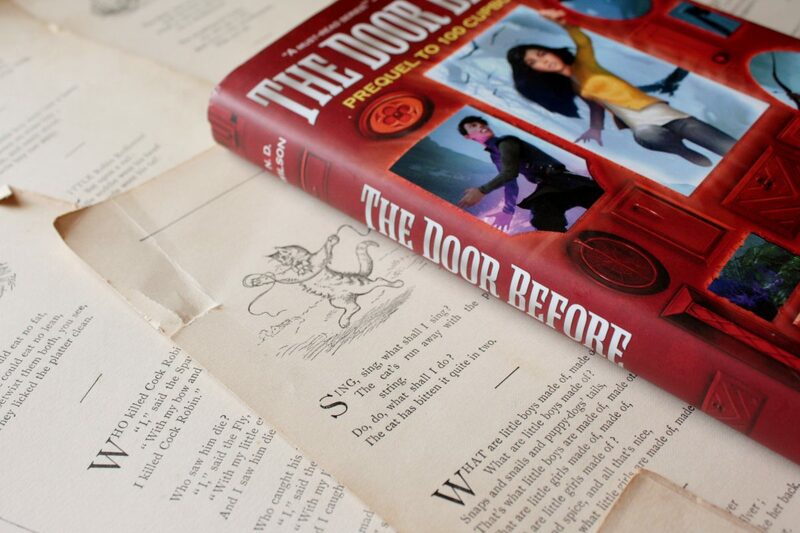 But I can tell you that the story of The Door Before is a powerful force, and I was swept into it immediately. The Door Before answers old questions and raises new ones, and makes the world(s) of 100 Cupboards seem both bigger and more well-ordered than before. Old characters appear throughout this book, and I wanted to cheer when I met them, the way we do when an old friend saunters onscreen during a new Star Wars movie. But I couldn’t, because Mitch hasn’t read the book yet. I cheered inwardly, ate some chocolate, and kept reading. Every book I read by ND Wilson cements his place at the top of my list of favorite authors—the way he views our world and his created world, the way he gives his characters room to move and make gut-wrenching decisions, enables him to craft stories that are intense and sometimes gruesome but always strangely beautiful, too. The Door Before is a welcome addition to the 100 Cupboards collection—one I can’t wait to reread alongside the original trilogy and the Ashtown Burials series in a giant ND Wilson binge. My dear friend Jennifer Harris interviewed me on her blog Every Morning, New Mercies! You can read the interview here and learn more about why I started this blog, how I know I’ve found a book worth reviewing, and when I fell in love with classics. But you should stick around and read her posts, too! “The Hospitality of Frog and Toad” is one of my favorites, as is her piece (featured in “The Warren & the World”) about Charlotte’s Web. And her post on the myth of balance is just lovely. For years I have followed a Bible reading plan that lures me into the nooks and crannies of Scripture. Without it, I’d be tempted to stick to the well-lit spaces: Ephesians, Luke, the Gospels. With it, I find myself greeting the day with a reading from Numbers, or forced to reckon with the strangeness of Daniel. I want the easily understood—Judges refuses to be that. But my reading plan takes me through Judges anyway. And through these lesser known, unsafe stories, I learn to love new facets of the Lord: I see his steadfastness in a new light, or come to understand a little more the way he works in lives of his people. 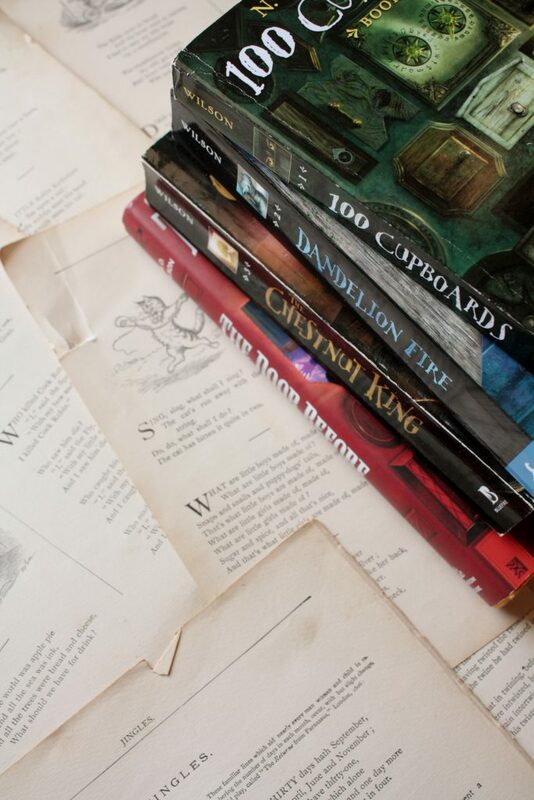 The best story Bibles dive into some of these nooks and crannies. But I haven’t seen many picture books that move beyond the top five Bible stories: Genesis, Noah, Daniel in the lion’s den, the Christmas and Easter stories. ND Wilson (author of 100 Cupboards) plunges off the well-trodden path of children’s Bible stories and writes about Abram, not yet Abraham. 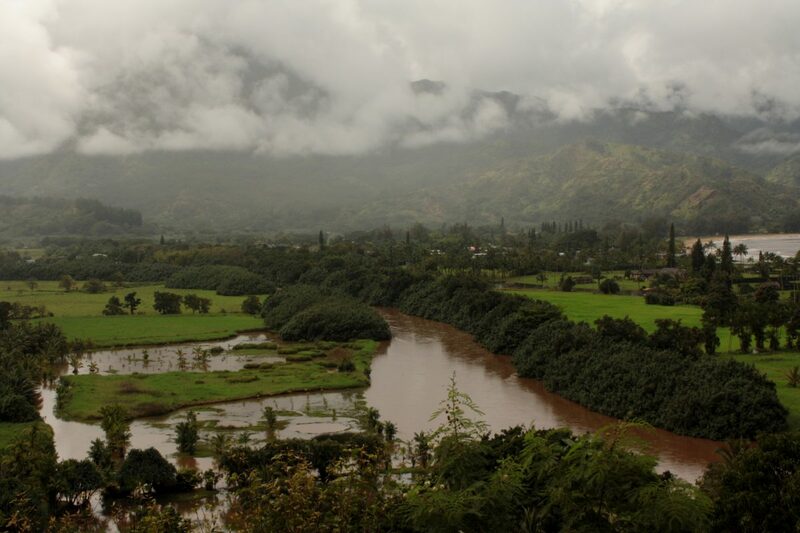 This isn’t the story of Abraham’s journey to fatherhood, but of Abram’s journey to faith. It’s a small book filled with battle and striving, and through it Wilson brings to life passages of Scripture often overlooked by adults and unfamiliar to children. 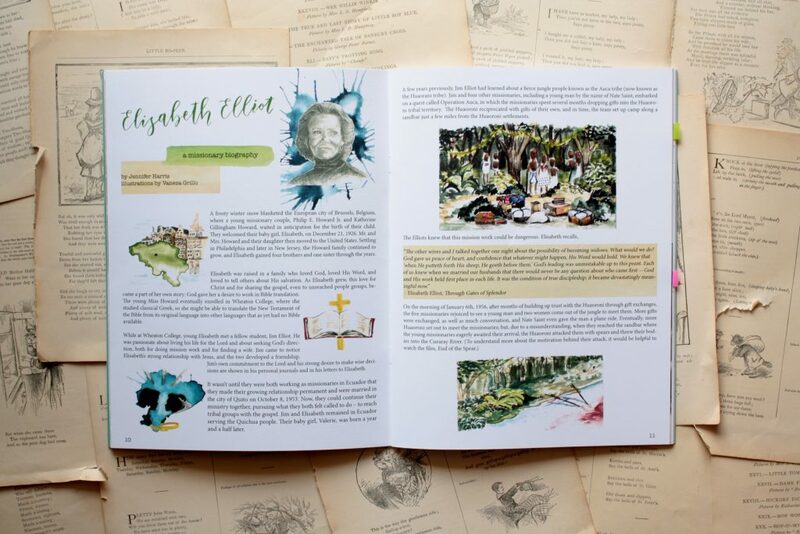 Forest Dickison’s illustrations convey a sense of movements, and his paintings pair with Wilson’s language to craft a story of how the Lord works in a human heart. 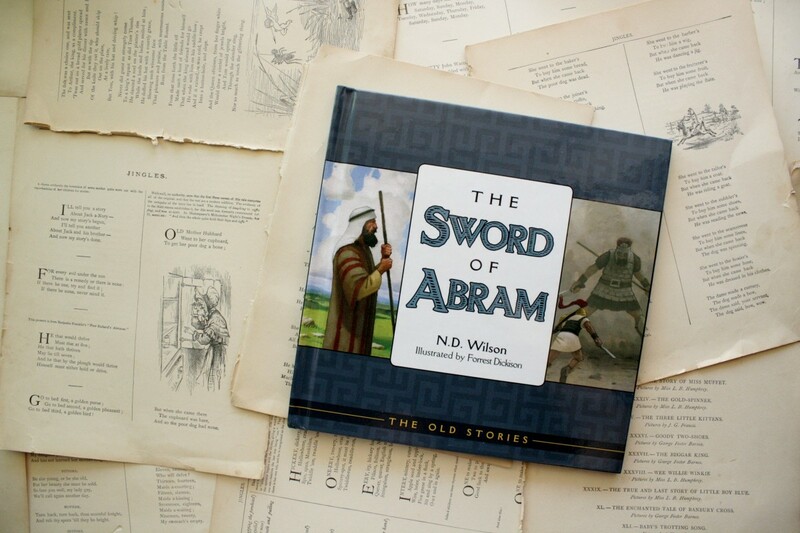 The Sword of Abram is a part of ND Wilson’s series, The Old Stories. I have yet to read the other two books in the series, but have high hopes for them, given the favorable review of In the Time of Noah on Aslan’s Library. 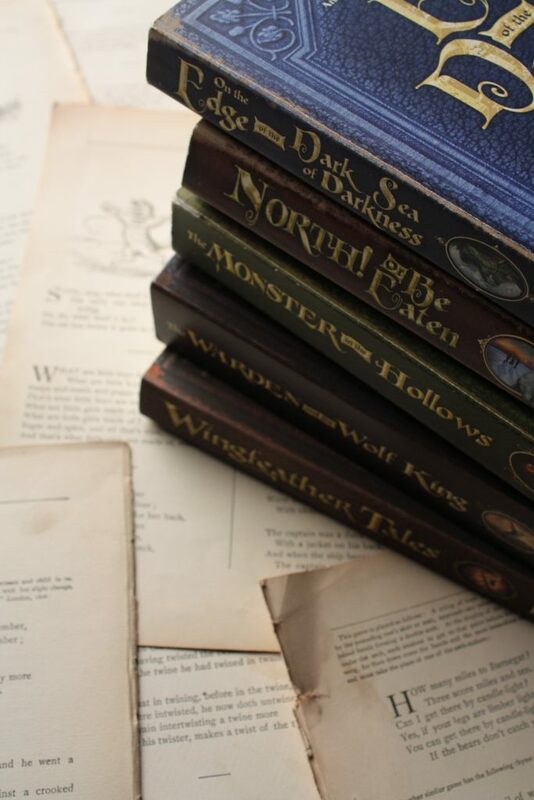 Have you read any of the other books? What did you think? I am a black belt in Taekwondo. By “am,” I mean “was,” as in “I earned my black belt in eighth grade.” And by “black belt,” I mean “zero degree black belt,” which is the lowest possible black belt a person can earn. But I like to toss that sentence—”I am a black belt in Taekwondo”—into conversations with boys of the ten-and-under set, just to see what happens. I don’t have a lot of currency with boys, after all. As a mother of three daughters, I can throw a mean tea party, tell stories about sweet, talking animals and no bad guys, and please everyone in my house just by putting on a nice dress and some lipstick. I am not adept at talking about football, playing ninjas, or understanding the appeal of wrestling. But I do know how to hold a nunchuck properly and I can still do a pretty decent side kick, so I like to think I’m not a complete dead zone where the boys are concerned. 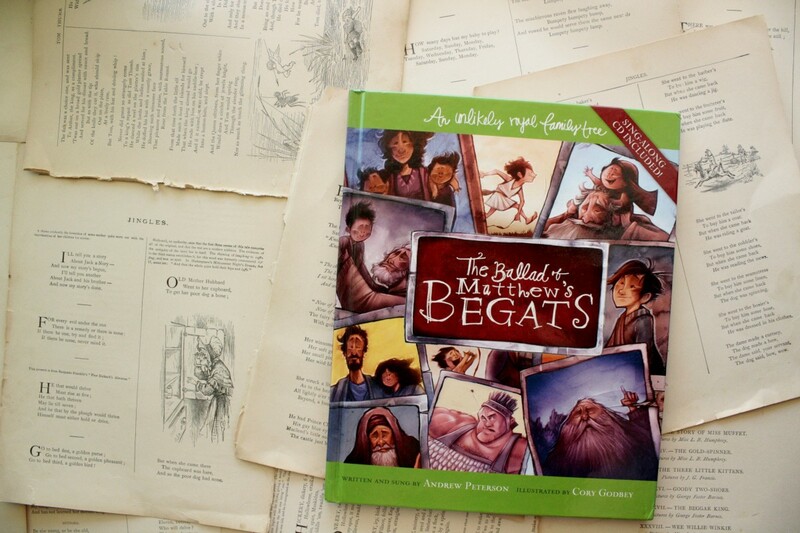 Likewise, I’m not that great at finding good books for boys to review on this blog, simply because there isn’t much of a demand for them at our house. When I do find a book that I think boys might like I get really excited—and then I second guess myself. I start asking friends if their sons read the book and if so, did they like it? Do boys even like that sort of thing? But I didn’t even have to ask about this one. 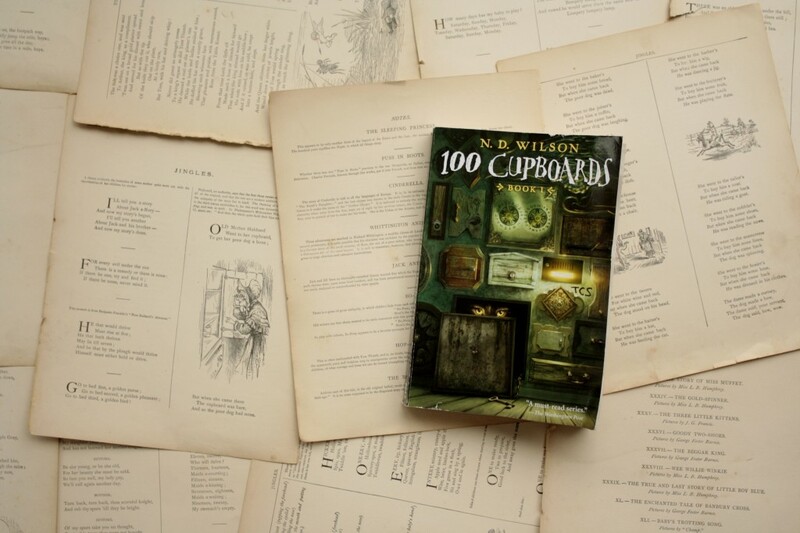 I read 100 Cupboards in about two days, got more than a little creeped out, loved it, and knew I’d found a winning book that didn’t center around an unlikely heroine in Victorian dress, a book that would doubtless appeal to boys, their sisters, and their parents. 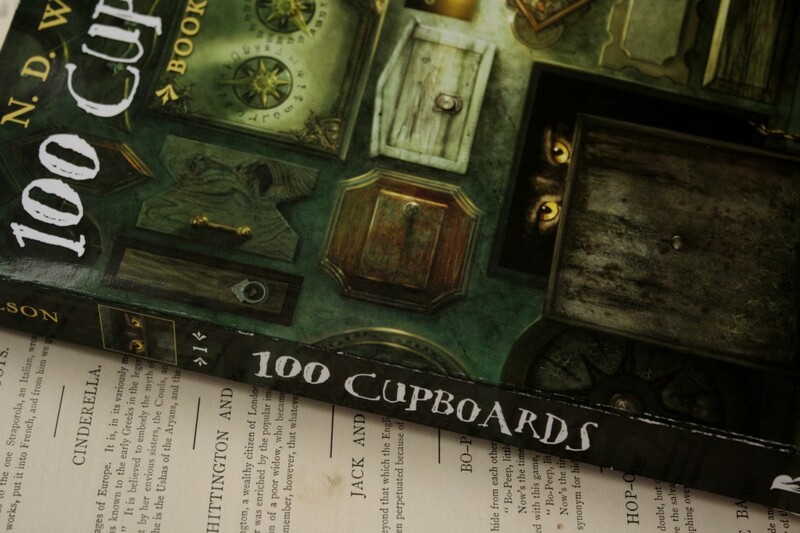 The premise of 100 Cupboards is straightforward and awesome: while staying with his aunt and uncle after his parents’ mysterious disappearance, Henry discovers a bunch of cupboards hidden beneath the plaster of his bedroom wall, each one leading to a different place including (but not limited to) Endor, Byzanthamum, and Arizona. 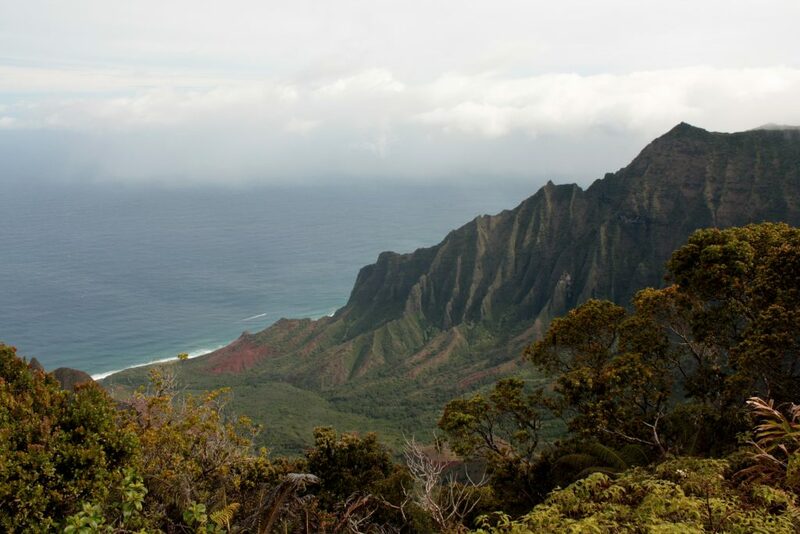 Adventure ensues. This is the first of three books, and though I have not read the other two, I am definitely looking forward to reading them. 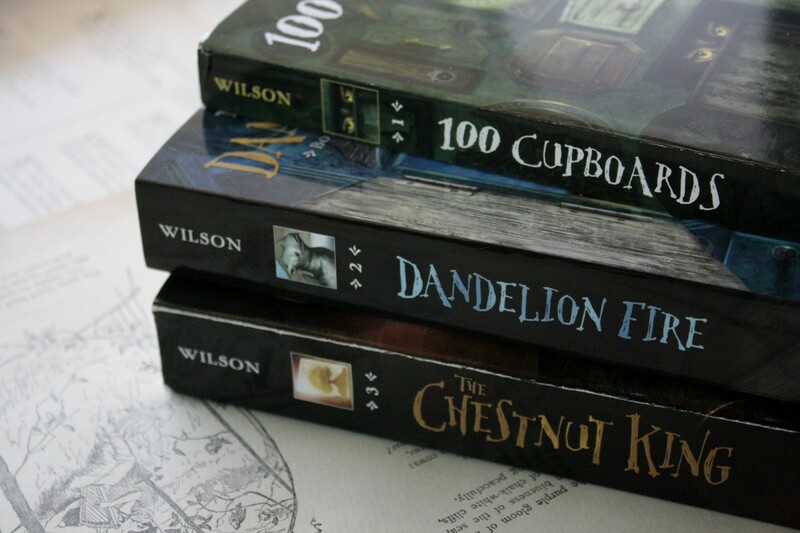 The worlds that N.D. Wilson uncovers are enthralling—I can’t wait to see what else he has hidden away in those cupboards. A word of warning, though: parts of this book are unsettling to say the least, so this may be a bit much for younger kids (or for squeamish older kids). I’d compare the creepiness factor to that of Coraline, if that helps. But it is an awful lot of fun to read. This is the rare trilogy that gets better with each book! I finished the third book yesterday, and actually yipped—my husband will vouch for this—”Woo hoo!” at the story’s climax. 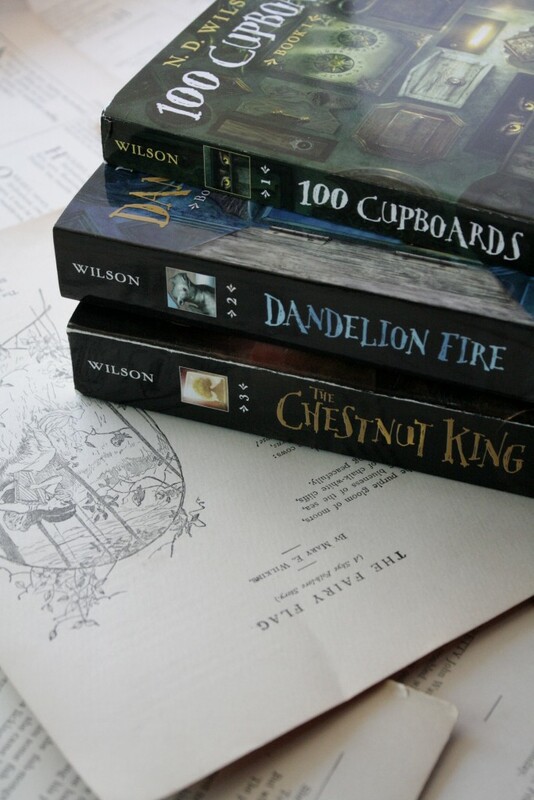 I may revise my post to reflect this at some point, but for now, know that I recommend not only One Hundred Cupboards but also its sequels, Dandelion Fire and The Chestnut King. 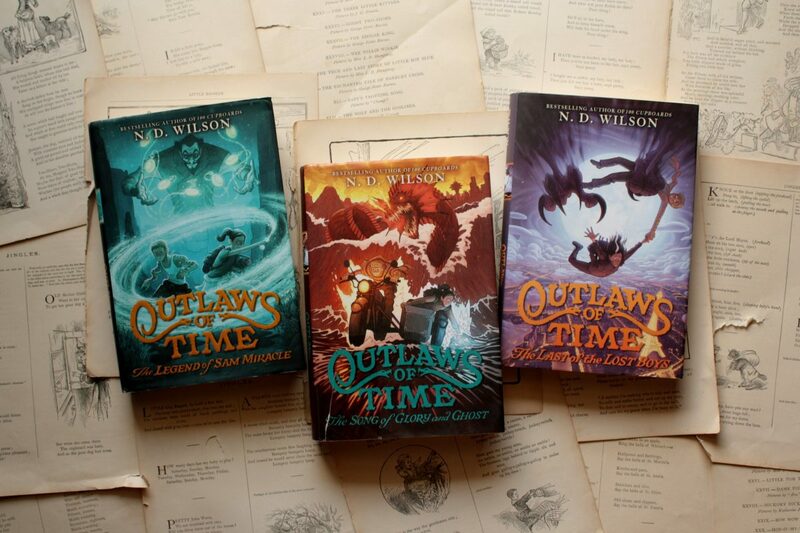 ND Wilson wrote a prequel for this series! And it, too, is glorious. You know the question that goes, “If you could meet any author, living or dead, who would you choose?” It probably gets asked as a “getting to know you” question at book clubs, I guess, and it overwhelms me every time I hear it. Just one? Why not five? Or ten? I don’t know what my list would look like or which names I’d have to whittle off to reach the single digits, but I am confident of this: N.D. Wilson‘s name would be on it. Or would have been on it. Because I did get to talk to him. And it was fantastic. When you’re able to sit in awe of an ant war on the sidewalk in front of your own house, then the awe that you experience looking at God’s creation near you, where he has placed you, will lead you outward. It will give you a desire to see more of his work, to walk through the rest of his museum. If we’re the art appreciators—the ones who understand that there is an artist and this is his work, and we want to celebrate it—then we need to do everything we can to create a beautiful artifact ourselves and not just have talking heads explaining fairly bland cinematography. We wanted to use our words and our cameras and our lenses in a more effective imitation than that. We wanted to tell the truth, and beauty is part of the truth. Normally, this sort of post—a “here’s something I published elsewhere” post—would be a midweek bonus affair, not something I would publish in place of a book review. But I think you’re going to love what N.D. Wilson had to say so much (I did, even after listening to the recording a half-dozen times as I transcribed it) that I decided to publish this instead of a book review this week. Go forth! Read and enjoy! There’s a spot on our porch I check every time I come home—to the left of the door, on the girls’ stripey chair. If I’m going to get a package, that’s where it will be, and if there is a package there, then it is probably full of books. There have been a lot of packages there lately, because, as I write, it’s nearly Christmas and I loathe going to stores (I drank the online shopping Kool-Aid early and never looked back). But a few weeks ago, I found a package on the stripey chair that said not “Amazon Fulfillment Center” on the return address but “The Rabbit Room,” and I knew that something very, very good was about to happen to me. I was right. 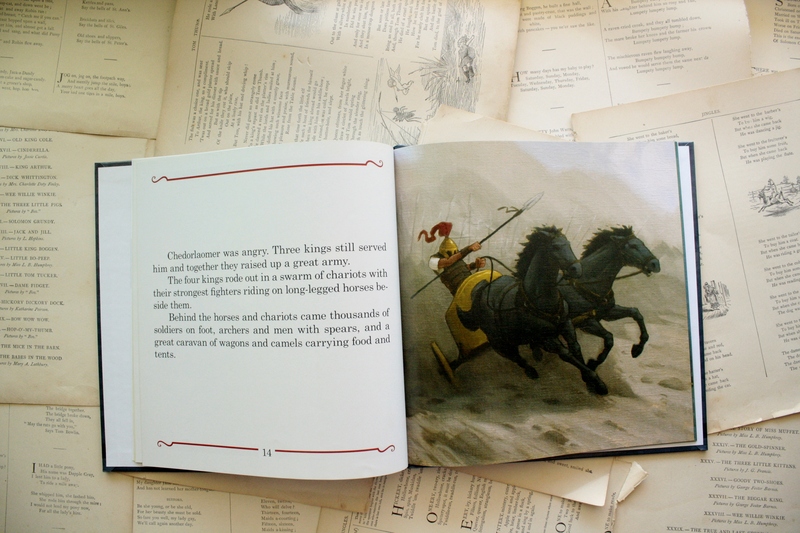 Stickers and posters and patches happened, as well as a signed paperback copy of The Warden and the Wolf King. Happy little girls with their hands full of stickers and posters and patches happened. 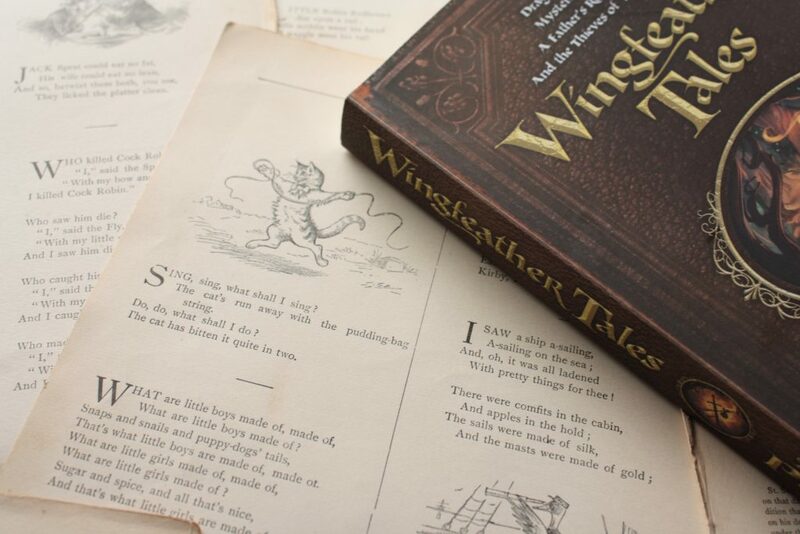 But I dug into the package looking for one thing and one thing only: Wingfeather Tales. When Andrew Peterson ran his most recent Kickstarter campaign, one of the stretch goals was this collection of short stories set in Anniera, but written by a handful of my favorite authors and illustrators (if you’ve read anything by them, then they’re probably your favorites, too): ND Wilson, Jennifer Trafton, John Hendrix, Justin Gerard, Jonathan Rogers, to name a few. That, I thought, looking at the line-up, is going to be awesome. But even with “awesome” as my starting point, I still completely underestimated Wingfeather Tales. The stories the authors turned out differ wildly in tone and style: some are comic, some epic, one is a narrative poem, one is a novella so devastating that I still can’t think about it without feeling an uncomfortable tightness in my throat. At least two of the stories cleverly link Anniera up with the worlds of other beloved books; one tells a story we’ve all been wanting to hear. The authors clearly enjoyed being set loose in the world of the Wingfeather Saga. I think I expected this book to be a fun sort of honorary member of the series, maybe a collection of extra material that would be pleasant to read, if not as good as the saga itself—sort of what Chronicles of Avonlea is to the Anne of Green Gables series. 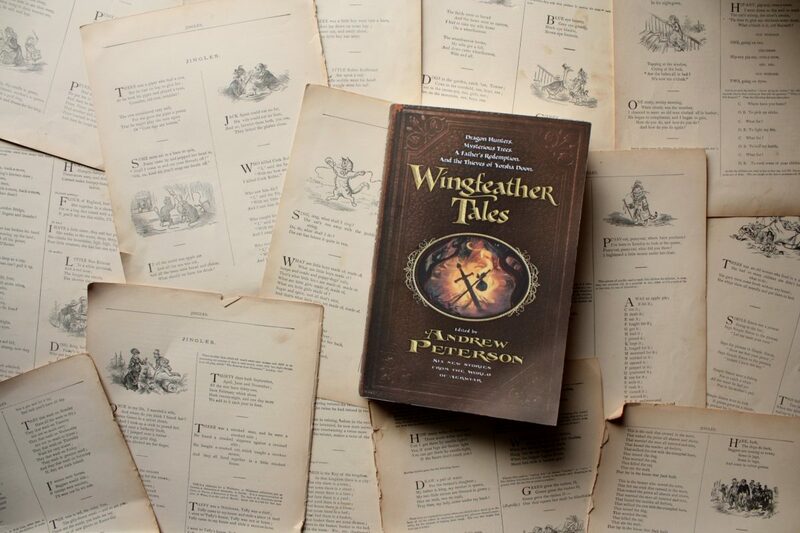 But Wingfeather Tales is its own beautiful contribution to the Wingfeather canon, so vivid and enjoyable that I can’t imagine rereading the full saga without re-reading the Tales, too. And that is beyond awesome. Remember my post about the nooks and crannies of Scripture? Well, no passages are more nook-and-crannyish than genealogies. 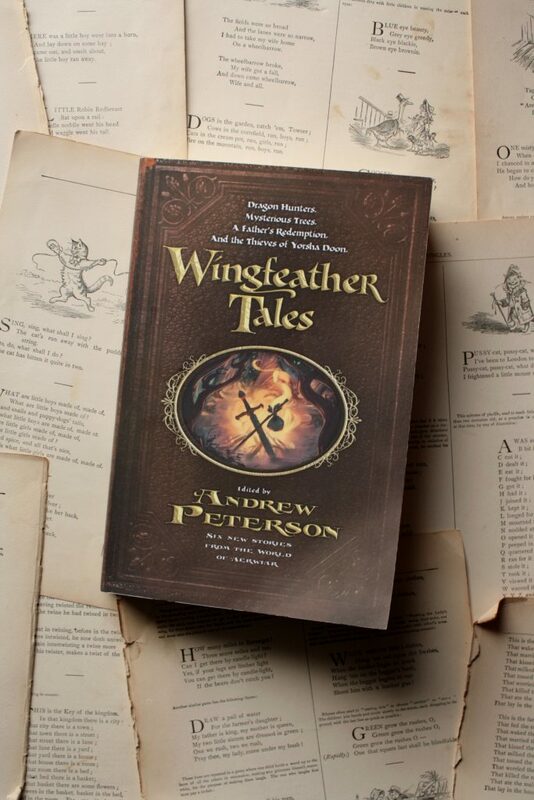 And if you can’t think of an author bold enough to turn a geneaology into a children’s book, then you, my friend, underestimate Andrew Peterson. 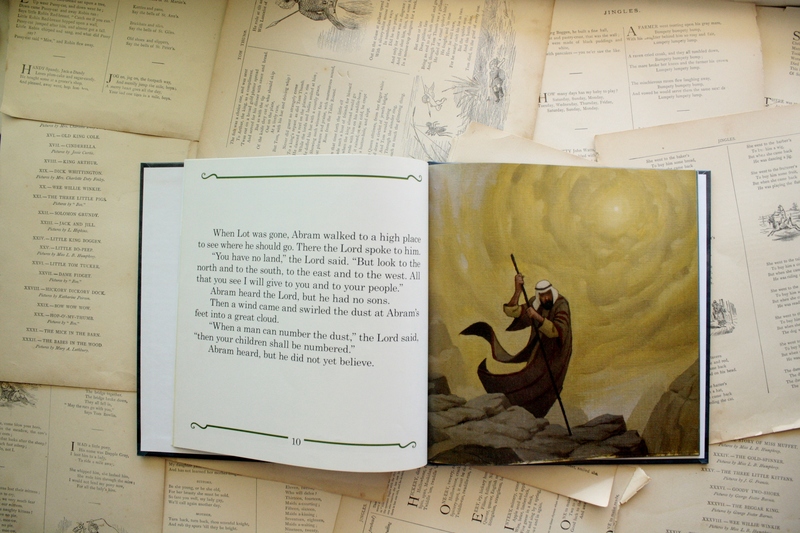 The Ballad of Matthew’s Begats pairs Jesus’ geneaology from Matthew 1 with Cory Godbey’s animated illustrations and puts the whole list to music: the book comes with a CD of Andrew Peterson’s musical interpretation of that famous list of names. 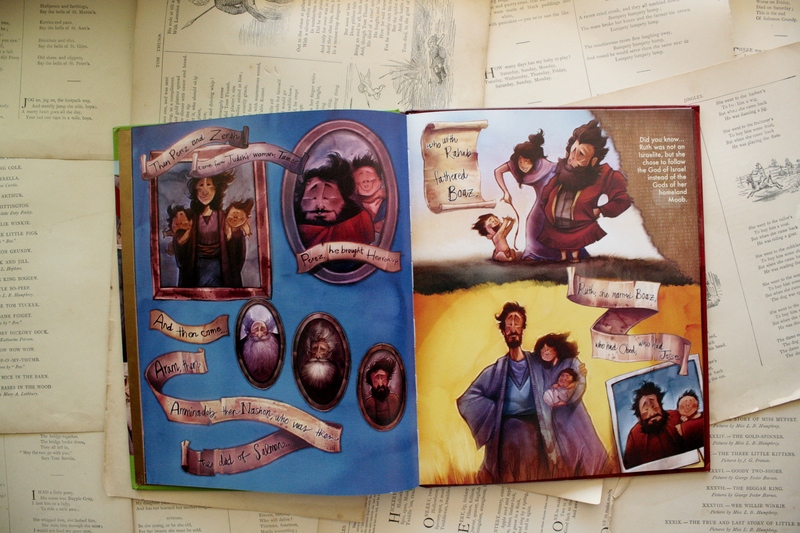 We have enjoyed all that, but more than anything, I love the fact that simply owning a book that makes a story (and song) of a genealogy gives our kids the idea that every part of the Bible is worth exploring—even long lists of names we can’t pronounce.